On Saturday, April 9, 2016 at 7:00 pm., Buddhist Global Relief will hold its fifth Concert to Feed the Hungry, at the Middle Collegiate Church,112 Second Avenue, New York, NY. Dedicated to the worldwide struggle against chronic hunger and malnutrition, the concert will feature Grammy-nominated pianist and composer Fred Hersch, percussionist Rogério Boccato, singer/songwriter Becca Stevens, vocalist Jean Rohe, and the Colombian folkloric ensemble La Cumbiamba eNeYé. The concert is produced by saxophonist and BGR board member, Dan Blake. Funds raised from the concert will support BGR’s many projects, which combat hunger worldwide, in regions ranging from Cambodia, India, and Bangladesh to Ethiopia and Cameroon to New York City. These projects not only provide direct food aid to people afflicted by poverty and disaster, but help farmers develop ecologically sustainable methods of food production, promote the education of poor girls, and give women the chance to earn more to support their families. Here in New York City, BGR supports a meal program for homeless youth and funds the development of urban gardens in communities with limited access to nutritious foods. Middle Collegiate Church is a culturally diverse, inclusive and growing community of faith where all persons are welcomed just as they are as they come through the door. As a respected venue for the arts, the Church features an Arts in Activism and Education ministry team, comprised of lay leaders and professionals dedicated to expressing Middle’s inclusive spiritual vision through daring artistic programming. Now you can watch this concert for free from almost anywhere in the world! All you’ll need is a computer or smart device and internet access. Invite your friends to view with you! Please join us for this evening of music dedicated to the struggle against chronic hunger and malnutrition. All proceeds support Buddhist Global Relief’s projects for hunger relief, agriculture, education, and livelihood in Africa, Asia, the Caribbean, and the U.S. Please also make a donation, so that you can help the hungry too! In response to the award, Rob said: “For me, better than the award is the fact that the campaign successfully promoted the concert and helped raise awareness of world hunger and fund BGR’s efforts to feed hungry people around the world.” It was Rob Barth who also designed BGR’s award-winning logo (see the masthead above), which over the years has been applied masterfully to our promotional materials by our team of talented professional communications designers. Through his work for Buddhist Global Relief, Rob Barth has certainly been living up to this commitment. We all congratulate Rob and thank him for his valued contribution. BGR’s Fourth Concert to Feed the Hungry was a memorable occasion. 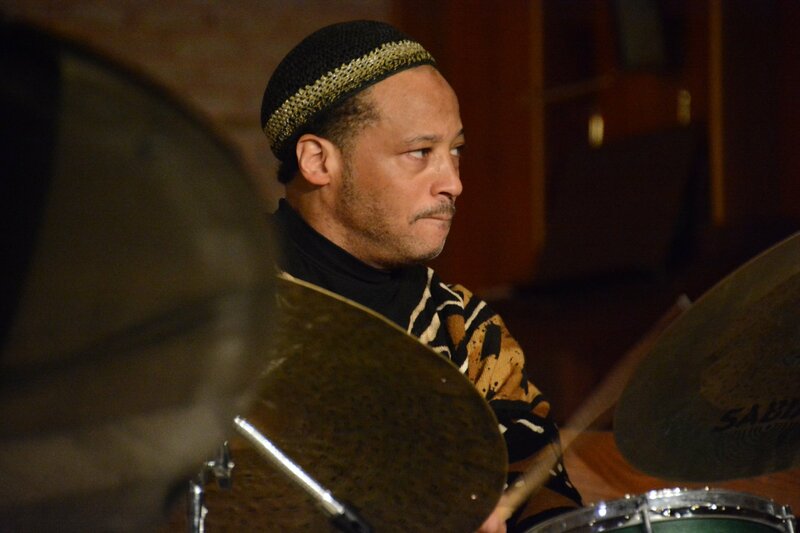 The concert was held at the Interchurch Center in New York City on April 30, International Jazz Day. 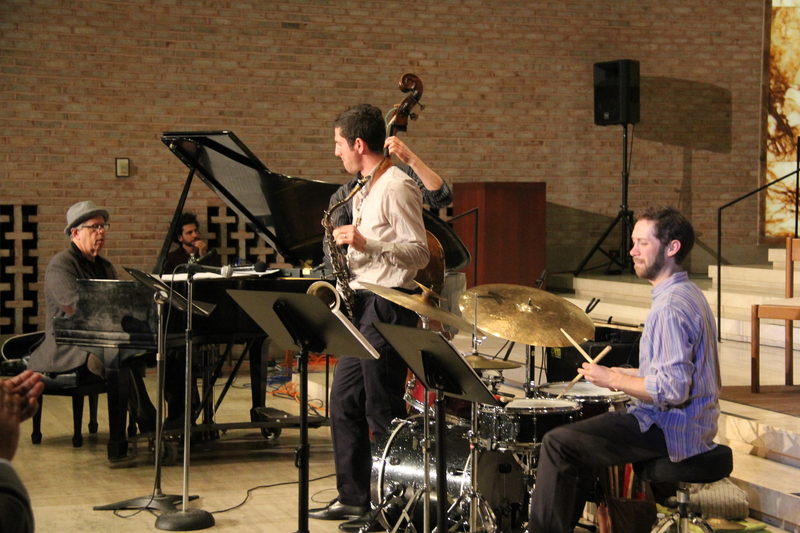 It capped a whole day of jazz-themed events by our concert partners, Jazzmobile and The New Heritage Theatre Group, at the Interchurch Center. Produced by jazz saxophonist Dan Blake, the concert brought together an all-star lineup of leading jazz artists with a global mission to assist impoverished communities around the world: bassist Larry Grenadier, singer and songwriter Rebecca Martin, jazz and blues vocalist Sandra Reaves-Phillips, drummer Winard Harper, organist Akiko, the Leni Stern Group featuring a West African drum team, and pianist Mijiwa Miyagima. All who attended agreed that the music was exceptional, and were united in their appreciation for the talented jazz musicians who donated their time to the cause of hunger relief. Our sincere thanks go out to Dan Blake and all the others who worked so hard to make the evening a success, to those who attended and those who made donations. If you were unable to attend, we hope you can come next year for a moving and delightful evening of music and caring. On Thursday, April 30, 2015 at 7:00 p.m., legendary saxophonist David Liebman, bassist Larry Grenadier, singer/songwriter Rebecca Martin, jazz and blues vocalist Sandra Reaves-Phillips, drummer Winard Harper, organist Akiko, and pianist Mijiwa Miyagima celebrate International Jazz Day as headlining artists at Buddhist Global Relief’s 4th annual Concert To Feed The Hungry. 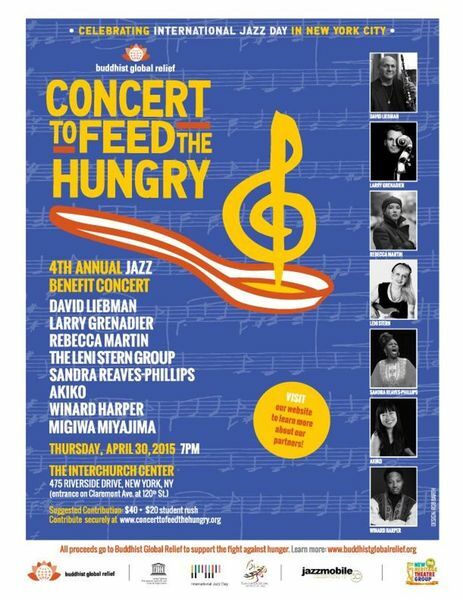 The Concert To Feed the Hungry perpetuates the global diversity of jazz in Harlem. This annual concert, produced by jazz saxophonist Dan Blake, brings together an all-star lineup of leading jazz artists with a global mission to assist impoverished communities around the world. Buddhist Global Relief sponsors projects around the world that help poor communities overcome hunger and malnutrition and provides education for women and girls in at-risk communities. The day-long event will commence with 2 music workshops organizaed by Jazzmobile and The New Heritage Theatre Group. Visit www.concerttofeedthehungry.org for more information about the concert and the artists.